North Dakota Highway 85 on March 23, 2013. On March 23, 2013 (a Saturday), I drove west on I-94 from Bismarck, North Dakota to the Belfield exit, then turned north on Highway 85. My goal was to make it up to Watford City to take in a discussion on the Dakota Wars, post-150 years. The previous evening the discussion was held at Sitting Bull College, and I attended that one too. But after driving on Highway 85 that early afternoon, at least after 20 miles of it, I decided to turn around and head back to Bismarck. The wind carries wisps of snow over the road, and it barely melts, and then freezes. In the afternoon, the roads were a kind of icy-slush, and my plan was to attend the discussion that started at 7pm, and then head back to Bismarck around 9pm. The temps would drop, and the icy-slush would turn to straight-away ice. In both academic and lay-person parlance, driving at night on these roads is what we would have called a “really, really dumb idea and follow through.” So on the afternoon drive up, I eventually pulled over at a safe place, called ahead to Watford City to inform the group that I had a change of plans, and then turned around and headed back to Bismarck. 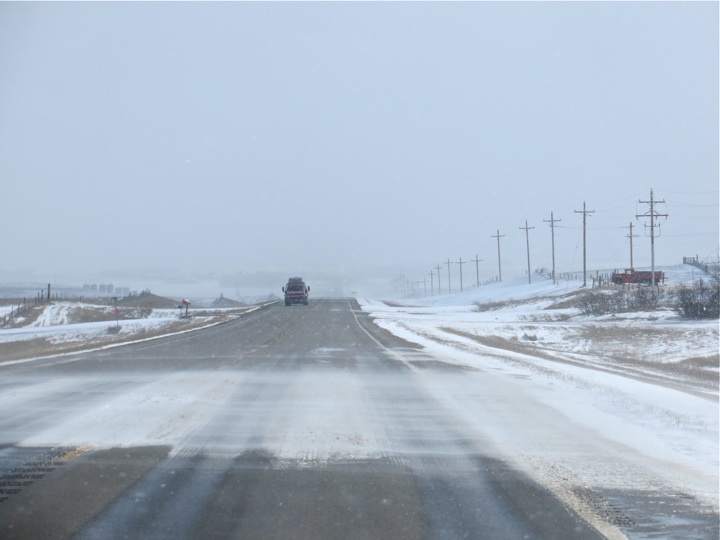 Before turning around, though, I captured an audio-video short of what the roads were like, a kind of cross-section of what western North Dakotans and oil laborers (they are increasingly the same thing) are exposed to each and every day. In the audio-video: to the right a pick up is driving in the ditch after having just slid off the road while in the left lane oil trucks whip by in the opposite direction. Stay safe out there folks, and don’t let yourself or crazed bosses or market forces hurry you any quicker than you need to be going. Remember this: the oil isn’t going anywhere, and it will be there tomorrow. This entry was posted on Monday, April 1st, 2013 at 9:04 pm	and tagged with Bakken, Man Camps, North Dakota and posted in Uncategorized. You can follow any responses to this entry through the RSS 2.0 feed.